Tagline- If You’re Going to Bury the Truth, Make Sure It Stays Buried. Starring- Jennifer Love Hewitt, Sarah Michelle Gellar, Ryan Phillippe, Freddie Prinze Jr. 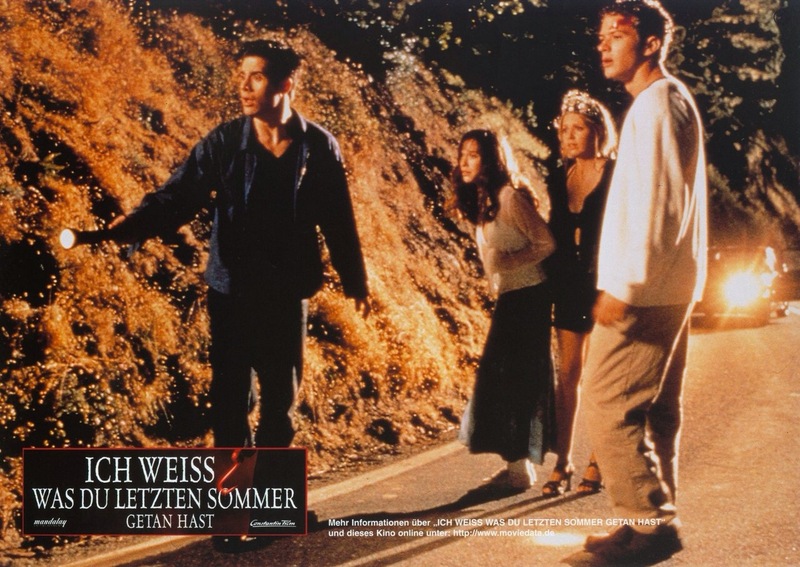 Released in 1997 I Know What You Did Last Summer was part of the slasher film revival along with Scream with both films being written by Kevin Williamson. When looking back at the 90s it was Kevin Williamson who redefined not only the horror genre, but the teen TV drama with Dawson’s Creek. But sticking with horror, when Scream was released in 1996 the slasher film was pretty much dead with only the franchises making any money, but even they were a little below par and the horror genre as a whole, while still successful to some degree was probably at one of its weaker eras in quality and the in box office. But with Scream, Kevin Williamson took an old and tired style of film and brought a breath of fresh air to it. I Know What You Did Last Summer is every bit as well written as Scream though they’re also both quite different. ILWYDLS while a popular horror film in my opinion is also vastly underrated as well. If you ask me oit isn’t just one of the best slasher films of the 90s, but its the best of any decade. Kevin Williamson was very much on the pulse of the horror genre in the 90s and I would rate him as one of my film idols and a writer I often look to for inspiration. Four friends make a vow to never again speak of the accident, in which they hit a man with a car and thinking he was dead they dumped his body into the water, but he was still alive at the time. Now a year later they get messages saying I Know What You Did Last Summer and soon enough they are stalked by someone who knows their secret and after a couple of appearances just trying to scare them it soon turns to murder as someone is out for revenge. The screenplay by Kevin Williamson is cleverly plotted with terrific characters with plenty of depth. What I love about the films written by Williamson is they’re actually well written and while there are plenty of excellently written horror films by this point in the genre horror films weren’t exactly known for having a plot or strong writing. The beauty of horror films is you can get away with a subpar script (well to some degree), but when well written it makes things all the better and Williamson is a great writer. Williamson has a style like every writer, but he isn’t a one trick pony either and IKWYDLS very much showcases how talented of a writer he is. Its refreshing to see a slasher film that actually is well written with terrific characters and the script actually plays out more of a thriller with slasher aspects thrown in. Director Jim Gillespie crafts a well paced film loaded with suspense and tension. Gillespie crafts much more of a thriller as the slasher parts are kept to a minimum until the final act. There’s been many films that mixed thriller and slasher and while some were successful the good bulk lacked identity, but Gillespie avoids that pitfall and neither the thriller or slasher take away from each other. IKWYDLS isn’t a body count film so if that’s what you’re expecting you might be letdown. The first murder by the fisherman doesn’t happen until the 38-minute mark. The next death doesn’t happen until the 72-minute mark. However in between death scenes Jim Gillespie builds an incredible amount of suspense and tension as the fisherman is waiting and watching. Once we get to the final act is when the film starts to play like the traditional slasher, but due to the build up its more effective than most. IKWYDLS also has perhaps the greatest chase scene of any slasher film. When the fisherman goes after Helen that whole sequence is the most effective scene in the film and in my opinion again rates as one of the best sequences in a slasher film. What fascinates me the most about horror films in the post-Scream era is the casting and I’ve mentioned this in past reviews, but there came a point when it was nearly impossible to land an actor with any fame unless they were at a low point in their careers and there’s no way any up and coming actors sign on. IKWYDLS has an excellent cast with the main attraction being Jennifer Love Hewitt and Michelle Gellar both who were terrific. My only compliant is Jennifer doesn’t put up enough of a fight, but Jennifer has this really sweet and wholesome quality, which makes her one of my favorite scream queens despite only having a couple of credits. I Know What You Did Last Summer was based off a novel by Lois Duncan and while I never read the novel from what I do know of it the book aims more for a young teen audience and the film while keeping the basic idea also very much strays. Lois Duncan has commented on her major dislike of the film and hated how it was turned into a teen slasher. Overall IKWYDLS is one of my very favorite horror films of the 90s and one of my all time favorites. This was at the peak of Kevin Williamson’s career and later in 1997 Scream 2 was released and was another massive hit. But who knew not long after this Williamson would hit a rut as after the Faculty in 1998 it would be a while before he found any success as the films he wrote or produced were box office duds and his TV shows post-Dawson’s Creek didn’t last very long. While the Kevin Williamson era didn’t last more than a couple of years he accomplished more in those couple of years than most in the genre. Its films like this is why Kevin Williamson is one of my film idols.